We make fitness fun and effective. And we are unlike anything else available. Fitwall workouts provide an effective blend of strength, cardio and flexibility training. The methodologies and coaching that we use applies to customers of all ages, fitness levels and interests. We utilize our piece of equipment, the Fitwall, along with bodyweight drills, dumbbells, resistance bands and other tools to offer an effective, comprehensive, safe and fun workout. Fitwall's unique technology platform inspires, guides, monitors and tracks your progress. All of our workouts are 40 minutes long. It's the perfect amount of time for an efficient, effective workout that fits into your day. 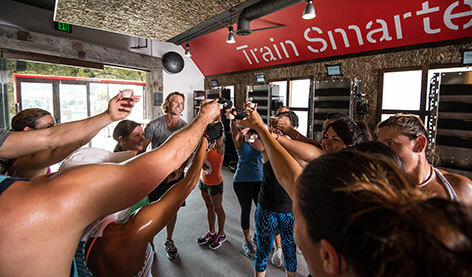 You and people like you are what makes group fitness so great. We actively engage our customers in the process of coming to the studio and coming regularly. Unlike many fitness companies, we actually want you to come and use your membership! We encourage making a habit of coming at the same times every week, too. All of that means you don't do it alone. It means encouragement from a team. It means you're a part of a community. At Fitwall we pay very close attention to the role that music plays in motivation, performance, and intensity of a workout. We do not simply have our coaches make their favorite playlists and play the music at a loud level, rather we carefully craft our custom soundtracks to match each specific workout. Every workout has a specifically curated custom Fitwall mix designed to push you further than you could go alone. When it's time to go hard the volume and intensity increases. When it's time to rest, the music changes and the volume decreases.